Although the BSPB have no authority to police the area it is important to do what we can to minimize disturbance. Illegal shooting and fishing in wintering area results in the geese wasting energy trying to escape and also cuts down their opportunities for feeding. The patrol schemes aims to monitor roost habitat and the implementation of the goose management prescriptions, to prevent illegal shooting of Red-breasted Geese, and disturbance due to illegal hunting and fishing. Anthropogenic disturbance threatens wintering goose populations because it results in increased energy expenditure through escape flights, and reduced energy intake through reduced time spent feeding. The patrol scheme is implemented in collaboration with the Regional Inspectorate for Environment and Water, Regional Forestry Service, the local association of hunters and anglers, local fishermen’s association. Disturbance at roosts is a particular concern. This is caused partly by hunters, but additionally by fishermen. Net-fishing from boats is concentrated around dawn and dusk; the latter can be particularly detrimental since it prevents the geese from settling at the roost sites in the evening. This takes place at the Project sites of Shabla and Durankulak. In the end of the 2013-2014 hunting season, the effect of establishing joint patrols was evident - during the hunting season no major violations of the hunting and conservation legislation were found, which indicates that the rules of hunting wild geese are now largely respected. It is the general opinion that the main problems come from non-local hunters visiting the area in January. During the first project year, the effectiveness of surveillance devices such as camcorders, digiscoping equipment (a small digital camera mounted to a telescope to capture images of distant objects) and camera systems was evaluated. A GPS system was installed on the vehicles to automatically record data on the location of incidents, to help target further patrols. 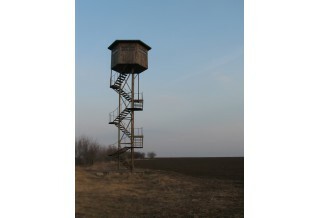 Two observation towers will be constructed/ refurbished at Durankulak Lake. As well as providing improved opportunity for observations by birdwatchers, and for monitoring of geese by fieldworkers, the towers will also be equipped with cameras powered by photovoltaic cells, to improve the monitoring of poaching. Their height will depend on their situation but will be up to 15 m.
At an individual level, this means that the geese have lower body condition than they otherwise would have, increasing the risk of mortality due to starvation and general poor health. At a population level, the effect is equivalent to a reduction in the carrying capacity of the site: fewer geese can be supported as a result of avoidance of potential feeding areas. In some cases, especially where roosts are severely disturbed, geese will abandon an area altogether. There are a number of sources of excessive disturbance at the project sites. Hunters pursuing legal quarry (e.g. Greater White-fronted Geese) disturb Red-breasted Geese by firing at mixed flocks of the two species, causing escape flight. 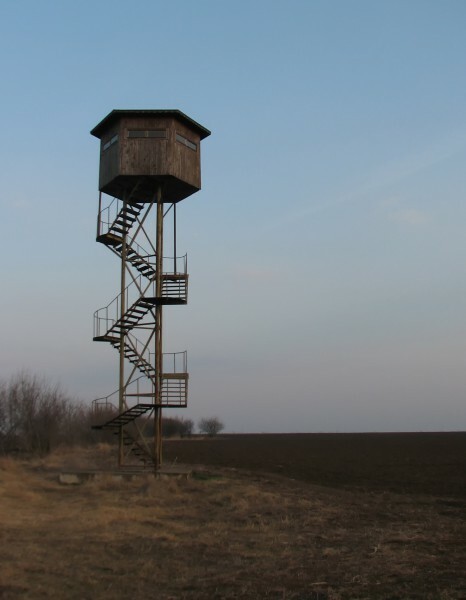 Although many major roosts are protected, these sites can still be seriously affected by hunting taking place just outside the protected areas, which is a particular problem at the Project sites of Shabla and Durankulak. In addition, of course hunting continues in the feeding areas, which are not protected. Farming operations may also cause some degree of disturbance at feeding sites. It can become a particular problem if the geese are deliberately scared to protect crops.More work needs to be done to liaise with local farmers to obtain their co-operation with regard to geese feeding on crops.